Part one of this title explained the history of the reason Holy Mother Church banned cremation. Although there is no longer a ban, the Church maintains the importance of our natural bodies and the reverence thereof after death. Bishop Morlino of Madison, Wisconsin reminds us that our bodies are heaven-bound. They will one day be glorified, as taught in 1 Corinthians 15: 42-44. He explains that the body’s destiny is heaven, not the grave. “We’re not disposing of the body in the grave…we’re allowing it to rest in order to have it raised up,” he said. “God has further use of that body. It is not a throw-away.”1 These teachings are only understood in the shadow of the second coming. The Catholic understanding and practice of preparing a body for burial comes to us from Jewish tradition. This is called the Tahara, a simple, yet dignified ritual that allows the person to meet his or her Maker with the utmost respect and dignity. 2The Tahara ritual includes cleansing, washing and dressing. Sound familiar? 6. 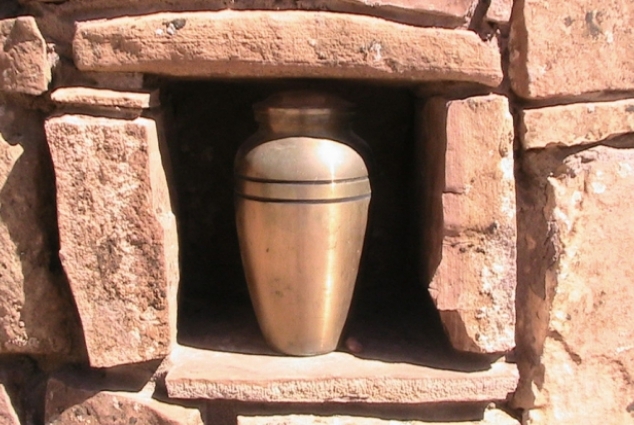 … the conservation of the ashes of the departed in a domestic residence is not permitted. … the ashes may not be divided among various family members and due respect must be maintained regarding the circumstances of such a conservation. Because we continue to remember our deceased loved ones in our memories and prayers, having a place we can visit is important to aid in our continuous healing. Likewise, a grave or mausoleum with a tombstone or marker helps to keep us grounded in the understanding that one day Christ will come and our loved ones, as well as we will rise from our graves with our glorified bodies to live again on the new earth. One hundred years from now, if this has not yet happened, people will visit our graves and know that a person precious in the sight of God is buried there, will offer a prayer for our souls, and will look forward to seeing us again in the second coming.